Easily identifiable from afar, as much by its volume as by its lovely curved lines, this new watch in the CARROUSEL collection is a veritable work of art. Entirely crafted by hand using invisible settings, the curved case is bathed in a crystalline cape of 161 baguette diamonds totalling 10.86 carats. Two hands with four faces tell the time, a concept that is unique in the world of Haute Horlogerie and Fine Jewellery. 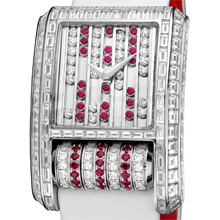 Seven river of white diamonds and rubies flow gracefully over the dial and the cylindrical carousel. The carousel is composed of seven distinct rings set with rubies and diamonds which turn at their own rhythm, independently from each other, while echoing their counterparts on the dial. The FANTASIA PORPORA comes with a magnificent bracelet made of black satin with an underside of red leather. It is of course a limited edition.